High quality culinary classes are now available to children and adults through the Montclair Culinary Academy. The Montclair Culinary Academy offers culinary classes. The Montclair Culinary Academy is a culinary school located at the Montclair Women’s Club that offers creative and healthy “farm-to-fork” style classes to both children and adults. Chef Karan Fischer and Lisa Davies have joined together to create the Montclair Culinary Academy in order to bring healthy and high quality food classes to the Montclair community. At the Montclair Culinary Academy, children and adults are taught food safety, knife skills, proper culinary etiquette, science, social and math skills. The courses are designed to teach the student chefs how to enjoy making and creating healthy and delicious food that they will be able to whip up in their own kitchens. The Montclair Culinary Academy also offers workshops, team building and private adult parties. Photo courtesy of Lisa Davies and Karan Fischer. With the beginning of the new year, there are many new classes available for interested student chefs to register for! Beginning in February at the Montclair Culinary Academy, Friday night is fun night. Classes will be held on Fridays where children will get the opportunity to cook their own dinner and take it home. Other classes in February consist of Tasty Tacos, Mac and Everything, A Taste of Italy, Sushi Class and more. The Tasty Tacos class will take place on Feb. 5 from 4 p.m. to 6 p.m. At this class, you will learn how to make your own tacos and salsa, as well as preparing everything that goes into them! The cost for the class is $50. The Mac and Everything class will be taking place the following week on Feb. 12 from 4 p.m. to 6 p.m. At this class, you will learn to make your own mac and cheese from scratch and well as some delicious chicken nuggets. The cost of this class is $50. The Sushi Class, which is offered to adults only, will take place on Feb. 25 from 7 p.m. to 9 p.m. All adults who attend will be taught how to make perfect rolls using sushi grade fish. The cost is $75. The Taste of Italy class is scheduled for Feb. 26 from 4 p.m. to 6 p.m. Here, student chefs will learn how to make spaghetti, meatballs and pizza from scratch. The cost is $50. Fischer, who specializes in customized, weight-loss gourmet food, spends much of her time in Manhattan, Montclair and the Hamptons, where she prepares and delivers to private clients and works with nutritionists and personal trainers to guarantees clients’ success. A very successful entity of hers titled “Karan’s Kitchen LLC” has created a healthy line of gluten-free products with national distribution. 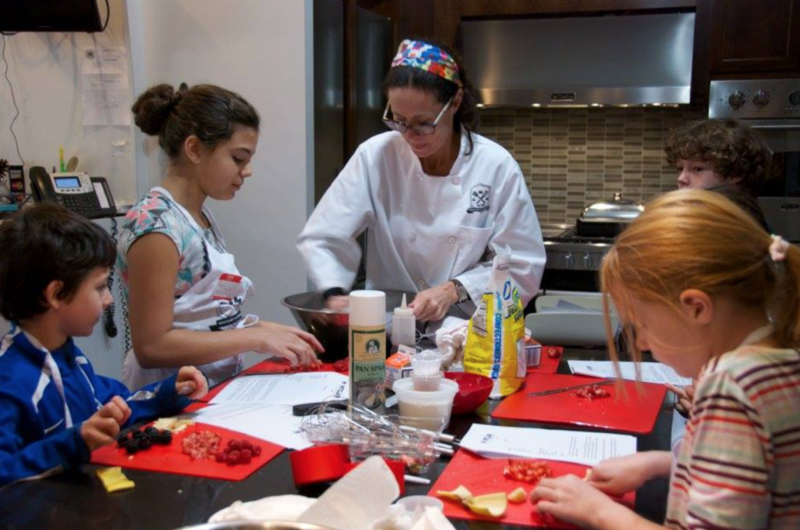 With the creation of her healthy food line and her passion of high quality eating, Fischer has been recognized by the NYC Board of Education as a Chef/Instructor for “healthy cooking” after school programs. She is also a member of the Speciality Food Association and Taste NY Events. While Fischer focuses on the healthy aspect of the food creations, Davies is passionate about real food. She graduated from the French Culinary Institute and went on to start a blog, titled “This Little Piggy went to the Farmers Market.” Not only that, but Davies wrote the “What’s for Dinner?” column for Barista Kids for several years. Davies also volunteers at the Salvation Army, and is the new Executive Director of the Montclair Food and Wine Festival. “For the culinary school, a few months ago, we wanted to see what would happen if we offered a class for kids and adults and the response was phenomenal. I was blown away,” said Chef Fischer. If you are interested in registering for a class at the Montclair Culinary Academy or interested in learning more information, visit montclairculinaryacademy.com or visit their Facebook page at Montclair Culinary Academy.